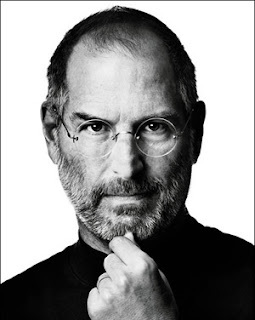 At Apple, Steve was Jobs one. In honor of the man and his inventions, I'm reposting a column I wrote a year ago about how Steve Jobs' inventions transformed a college instructor into Captain Kirk. Set the iPhone for stun. Today, I ran around from meeting to meeting in my orange, V-neck sweater, getting things done and saving the world with my iPhone, iPad, and a Jack Sack full of whatever I might need on today's season of 24. I was feeling good about myself until I got a glimpse of my reflection in a window and thought: "Oh, crap: I'm Captain Kirk!" We're surrounded by some serious sci-fi hardware. No, the cars don't fly, and the robot butler is MIA, but can you tell me that the iPhone isn't a Star Trek communicator? Or that the iPad isn't a tricorder? Sadly, the orange V-neck sweater is still the orange, V-neck sweater. And I haven't sussed it out yet, but the receding hairline is either a tribute to William Shatner or a dying Tribble. The green-skinned girlfriend has yet to materialize. Boo! "It's a portable computer. I use it to surf the net, play games, listen to music, make phone calls..." and that's where they would've burned me for witchcraft. Whenever someone tells me that he or she thinks the iPhone isn't all that - too expensive, or whatever - I like to remind them that not too long ago, any ONE of the 180 apps on my iPhone would've rocked their worlds. Don't beam me up, Scotty, because there's some pretty wicked crap down here on Earth. It all reminds me of the time my friend's Dad couldn't find the fast-forward button on the TV remote control. After struggling for five minutes, he desperately asked, "How do you make this go to the future?" In the documentary 'How William Shatner Changed the World', Steve Jobs says that the iPod came about after seeing Data on the Star Trek: The Next Generation episode "A Matter of Time" scan through various orchestral pieces instantly at his fingertips. He was also allegedly involved in developing a suit for virtual reality experiences, not unlike the Star Trek Holodeck. I watched that episode the day I got my first iPod & said a little Trekkie prayer of thanks.